A French-German woman from Berlin, a Belgian woman with origins from Hong Kong, a Spanish Basque man, a British Welsh woman, a French man with Congolese roots and an Hungarian woman from Budapest. This is not a joke. It’s the One Land Many Faces performers at work together with a French- Belgian artistic team. They aim to question together with the audience what makes them Europeans. How may they tune their identities? Understand each other? Create together? One Land Many Faces commissioned 5 authors from South Korea, United States, Hungary, Belgium and Germany. Gathered in Berlin in December 13’, they crossed their sight over Europe through a first writing workshop. Then, split into duets they visited the project partners in the Basque Country, Hungary and Wales to draw new inspiration. From this experience as well as their own background, they wrote 5 different texts. This material brings stories, encounters, songs. Many different ways, paths, meridians. At the crossroad of their identity legacy and the European project itself. September 2014, Brussels. 6 European performers meet a director and a musical director for a first residency. Together, they find their way between the texts provided by the authors and, at the same time, explore the songs and musics inspired by all those idioms (english, french, hungarian, german). They also find echoes from Africa, Asia and America in the very heart of this strange cosmopolitan crew. January 2015, Paris. 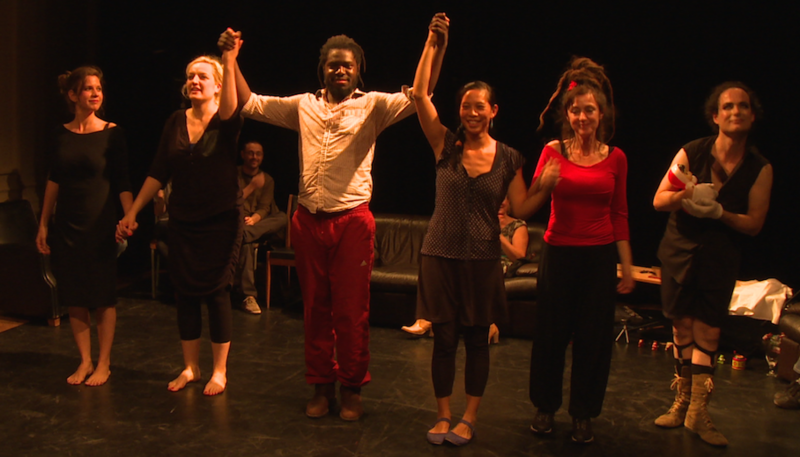 The One Land Many Faces company gathers again and creates for the stage the different texts, performing them at Le Carreau du Temple, and involving the audience through dedicated workshops. From this experience, the group gets the conviction that the next step of the project will be a new experience made of workshops with the audiences associated to performances of the short theatrical forms given by the authors. Finally, One Land Many Faces wishes to launch an invitation, and offer an open stage for a creative dialog on the European identity in progress. Not only where do we come from, but more what kind of dream we may elaborate together to “re-enchant” our future. Ortzai Theatre, Vitoria Gaseiz (Spain).